Dual Pane 1” insulated Glass Unit with laminated glass which is Extremely difficult to break. Ordinary annealed glass breaks easily Tempered glass, while stronger, shatters under a greater impact But laminated glass is different If laminated glass is broken. the vinyl interlayer remains in the frame, with glass fragments adhere to the interlayer This provides a strong barrier against forced entry and cannot be cut from one side only, which renders glasscutters useless. we’re showing the most common configurations, there are many more. We took our triple pane frame and designed a high security laminate dual pane window. Full 1” Insulated Glass Unit with Cardinal® Laminated glass which is extremely difficult to penetrate. Excellent STC Transmission, say goodbye to the sound of the neighbor’s barking dog. We have actually used this glass combo and frame for sound studios and sound stage applications. Beautiful, maintenance free, all the high end features without the high end price..
No FLIMSY vinyl here. Relax with virtually maintenance-free vinyl frames that won’t warp, rot, peel, or fade. Equal sightlines make this window very pleasing to the eye. Night Latch as an extra security feature for safe night time ventilation. Live worry-free with United’s Full Lifetime Warranty with glass breakage protection. Enjoy effortless operation and easy-glide window panels with smooth composite rollers. Enjoy superior energy savings and protection against fabric fading and sun damage with Cardinal’s LoE366® glass. Argon gas filled insulated glass unit for superior insulation. Optional Internal Grids (in between the two layers of glass) available with many patterns to choose from. 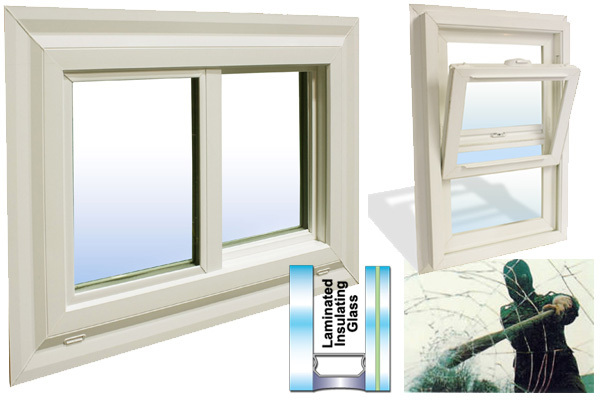 United Windows® only uses high quality Quanex® energy efficient spacers which are guaranteed not to fail. Available in Retrofit Fin , Block and new construction frames. One –way weephole technology let’s the moisture out but keeps dirt dust and insect from coming in. AAMA and NFRC certified to meet or exceed industry structural and energy efficiency standards. Heavy Duty Composite wheels allows the slider to smoothly glide across its track and will last forever. Push Button Spring-Loaded Night Latches add security while allowing both the sash to remain partially open for ventilation.